One that I have wanted to try for a long time was eBay dropshipping, I have an old eBay account in good standing which I turned into a business account. The tools used in this method come with a trial, letting you test the waters and get familiar with the workflow. Out of various eBay listing tools I prefer Hydra Lister as it comes with a lot of useful features, is fully integrated with Skugrid, and is at the right price point for me as it doesn’t come with any limitations as to how many items you can list. You can use Hydra Lister to create Single/Batch(Bulk) listings, paste product links from various suppliers and hit launch and it does all the work for you, I listed ~1000 products on eBay in just 2 days. These are the pricing tiers, I highly recommend trying out the 20 listing trial first (scroll down on the pricing page) and then when you make your mind up getting the Multi Suppliers Lister to list from other suppliers than just Amazon. To pay for a non re-occurring license find this link below the pricing tiers. This is what the main interface looks like, for some reason the sales aren’t currently tracked that’s why my graph is flat. These are my global settings, Hydra Lister allows you to filter certain words so they don’t appear in your eBay listings. You can also choose to have VERO Protection On which basically protects you from listing items that certain brands have banned from being listed on eBay. This is what my profit settings look like for the Single/Batch Lister, this allows me to have a $5 – $10 profit per item depending on the price of the product. If you want to list an item all you need to do is copy the product url ( it has to be either Amazon or from the other supported suppliers) and paste it into the lister. If you’re doing a single listing you can change some of the information like title, description, price. I use the Batch function most of the time as it’s the quickest. Great eBay price tracker and inventory tracker, also supports Amazon. Skugrid is integrated with Hydra Lister, all items listed with Hydra Lister are automatically synced in Skugrid and updated when their price/stock levels change. You can use Skugrid without buying Hydra Lister if you prefer to list items manually but still use the price/inventory tracking features to make sure you don’t sell things that aren’t in stock. I have 1763 active items on eBay, I am repricing/checking my items every 24 hours but you can choose to have them checked more frequently, I chose to do it less often to save money. Based on my usage (10k credits a week), keeping track of around 1000 items will only cost you $15 a month (50k credits), you can also save money by buying a bigger credit package as all unused credits rollover to the next month until used up. Over 150 different suppliers are supported which gives you a lot of room if you want to avoid Amazon. There’s more stores below and the nice thing is that you can request Skugrid to add a store of your choice. A part of my inventory on eBay is sourced from Amazon, I am taking advantage of the 30 day Amazon Prime trial to save money that would be spent on shipping. Using Amazon Prime to dropship isn’t allowed, however if you don’t use One Day Shipping and instead use Standard Shipping you should be fine, I have processed 40+ orders and I haven’t been banned. After my 30 day trial expires I simply make a new account with a new email. I’ve started using eBay’s Promoted Listings feature and as a result had a lot of sales from sponsored listings. Once you create an advertising campaign and add products to it, you can define the percentage of the items total cost that you will pay extra when the item sells, this is a really good feature compared to for example Amazon which makes you pay per click. Not try eBay US with this method? I picked eBay UK so I’d have an easier time if someone wanted to return something, not really sure if I would have more sales on eBay US instead, I know a lot of people do sell on eBay US though, I’ve joined the facebook group for Skugrid and a lot of people seem to dropship on eBay US from what I’ve seen. I could do both if I wanted to, I’m limited on listings at the moment so I can’t test it. What’s package you use on eBay? Basic, Premium or Anchor? How many delivery days for standard shipping if I use trial of Amazon Prime? It’s mostly 1-3 days after the package is dispatched, that’s why I set my processing time to around 3 days as it usually takes that long to dispatch. Have you experienced problems issuing refunds on eBay? Yeah, I have tried to find profitable items on Amazon manually but most of cases, I got same price or lower price on ebay. When you used the Lister, have you got the same thing? When im searching for items to list from Amazon I sort by newest arrivals, this usually helps me list products that haven’t been listed yet by other people. If the product is already listed on eBay by someone else I don’t really care and I don’t check because it still sells if it isn’t insanely overpriced. I have around 2100 active listings on eBay and get an average of 1-4 orders a day, what helps me drive sales a lot is Promoted Listings which comes with an eBay pro subscription. Im just thinking you should get 10 orders a day. Hope you will or better soon. How much did you earn after all fees from the last month with 2100 listings ? Yea I’m not sure if it’s because of the season right now or because of the products I’m selling, I think after summer ends my sales will increase. Last month I had less than 2100 listings, I think it was around 1700, my profit for June was $128 ( I spent $90 on eBay sub fee 19 may – 15 jun + $90 eBay sub fee 16 Jun – 16 Jul + $90 on hydralister, that’s $270 on fees). This month I didn’t buy hydralister and only had to pay for the eBay sub fee once and my profit so far has been $218, I should end this month with at least $250. 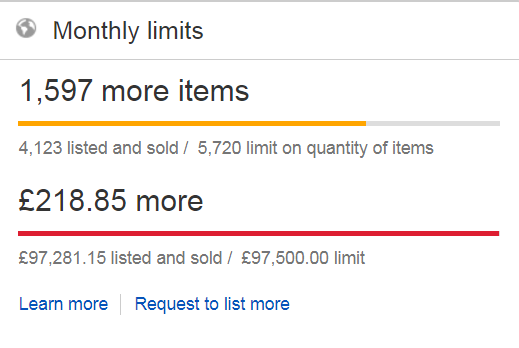 To be exact I have 2358 active items and eBay just increased my selling limits but they only increased the quantity limit without increasing the money limit so I can’t list more items http://i.imgur.com/OPJFM4r.png if they increase my limits further I could add another 800 products. Yeah, no secret in your sharing. Thanks for that. Im going to start. So could you suggest me that I should start with AliExpress to Amazon or Amazon to ebay like this story? Amazon to eBay is faster but you need an eBay account with at least 200-300 available listings, if you don’t have that I suggest you build up your account by manually listing without Hydralister. First of all. Thanks for allnthe usefulninformation. I already read all your pages. One question here. Isn’t the final customer receiving the goods in an amazon box? How do you handle that? I have only received 1 complaint so far regarding the amazon packaging, if anyone complains you can always tell them you stock your products in Amazon’s Warehouses and that’s why the product is in Amazon Packaging. still there bro? how go things eh? Yeah i’m here, things are going ok, not as good as before but sometimes you have to make some changes if things aren’t selling anymore. Are there any questions that you have? Please post some words about dropshipping order management. Do you process them manually? It will be great to read the whole process. Yes, every order is done manually. I have a good experience in eBay sale (real stock, $10-20k turnover). But want more freedom and decided to go dropshipping way. Made some research and see that order fulfilment is a weakpoint of almost all schemes. One more question: why you prefer skugrid instead of shopify+oberlo+inkfrog ? I found that Inkfrog is not a very good package overall, also I wanted something that doesnt just support Amazon but many other suppliers.